Just a short stroll from Waterloo Station and Southwark Underground, hopping on a tube is easy. After a day's work or play you can kick back in our on-site bar and restaurant before retiring to the calm and comfort of your room. At all times, our dedicated team will be on hand to make sure your stay is nothing less than perfect. A short walk from the River Thames, our central London location lays out the city at your feet. Check out the London Eye, Big Ben, Tate Modern and Borough Market - they're all within easy walking distance. Booked last minute. Very basic ‘classic’ room. £260 for 2 nights that’s not including breakfast. Very stingy with room refreshments, no doors on wardrobe and no tissues, bed very uncomfortable but room very quiet. Expected a bit more for our money as stayed in a number of hotels in London over the last few years for around the same price and most were a lot better. Good position in Southwark though and Blackfriars tube station approximately 200 yards away. Location was excellent,hotel very clean ate at hotel meals good..Staff couldnt have done more...helpful and friendly.If I return to London would stay again. Even though there was obviously an IT problem going on the staff checked me in relatively swiftly. The room was basic but comfortable and quiet so I enjoyed a peaceful sleep. The hotel is big, located near the metro station, and the staff were very friendly. This is the second time I stay in this hotel, however, the hygiene has deteriorated. Towels were dirty, floor and tables were dusty, indicating that there was no daily cleaning apparently. We had to call to replace the toilet liquid soap which has been empty for 2 days. the Same hygiene problem is noted during breakfast : Plates, cups, forks are still wet and dirty, probably because it is too crowded during breakfast time. Large Rooms, comfy bed, TV too small, Bath room is terrible! Frequent guest. ok room, but bath needs to change... old moist bathroom . dripping from roof. no pressure what so ever in shower. have complained about this since 2013. One night business stay: phone faulty / not programmed to contact reception, so had to go down to report other faults. Staff member came to resolve fairly promptly, but clear that room checks had not been completed fully. Breakfast - once great - now losing pace. Healthy poached eggs replaced with grey scrambled, bacon equally grey and flaccid, tinned syrupy fruit instead of coulis for the natural yoghurt, only white fresh bread. I often stay at this ibis hotel and this time was allocate a refurbished room. It was very nice, but only one electrical outlet worked, three were inoperative. Staff were excellent, as usual. I was pleased with my room and all services. The breakfast was very good as well. The exterior areas of the hotel were very nice but the bedroom was very very basic and overpriced. Anywhere else in the country the room would have cost £45 a night maximum. It felt more like a hostel room than a hotel. A pleasant stay, close to the underground tube. Although we booked two double connecting rooms, one door was not opened. The hotel is near to Tesco's and Sainsbury's stores as well as pubs and cafes. Everyday clean service. We did not try the breakfast but it seemed really good. Check-out was a bit confused, and at the end I havent received the invoice via mail and the person created another Accor account. I thought those data had came automatically during booking, but apparently no. Lovely room on the top floor - with a fantastic view. Good service, staff were polite and very helpful. Breakfast was excellent. I was only staying overnight after a social occasion in town. 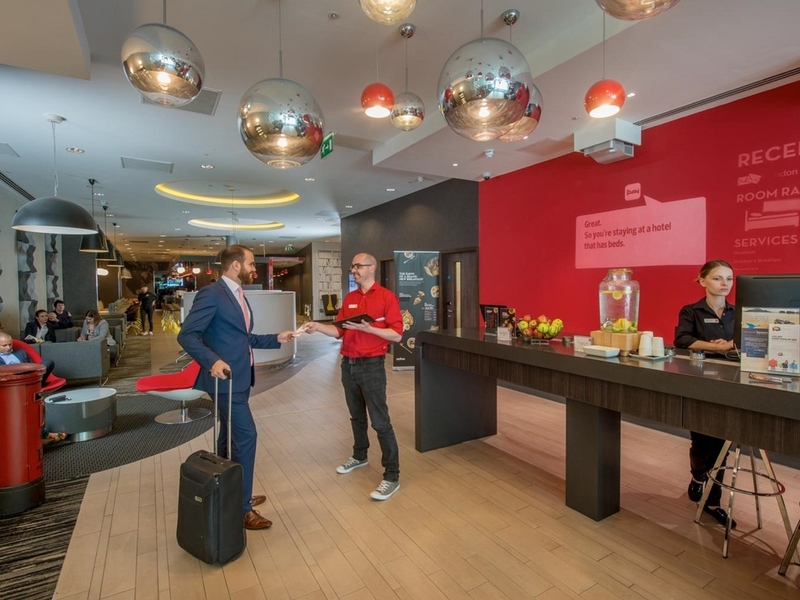 The Ibis is in a great location only 10 minutes walk from Waterloo station and less from Blackfriars. As I was travelling to/from Waterloo and was out in Blackfriars this was a perfect choice for my stay. I checked in online so was given my key on arrival without any need for paperwork and checkout was a key drop - painless. Hotel was quiet even for central London. Ideal for my needs. Comfortable room. Very helpfull staff. Excellent location. Good clean hotel just what I wanted. Usual friendly, polite efficient staff. Great new rooms!! Greeted with a friendly smiling face. Checked in with ease. The room was to the new style and I really loved it. Very simple and modern and definitely to my taste. Even a rug on the laminate flooring to give a truly English feel! I still believe a little work is needed on the comfy level of the bed mattress and pillows but acceptable. Late breakfast for me but the poached eggs still had a soft runny yolk - must be some kind of chef's magic! Simple hotel with basic facilities, but still quite pricey. Beds are very poor. Breakfast is typically British oriented and misses a European finish with several types of toppings for bread like cheese, ham and marmelade.